Is Facebook pushing further into Google's territory? It sure looks that way, as the company has quietly begun rolling out more search-driven advertising, including a new category of Sponsored search ads. Last month Techcrunch reported that Facebook had begun placing text ads—i.e., sponsored listings— directly within the search results that automatically appear as a user types in a query on Facebook.com. Then last Thursday Facebook began expanding that test. Now, when some users type in a search query on Facebook, they'll encounter stand-alone ads labeled Sponsored atop their search results, rather than intermingled with the organic search results. In other words, Facebook has created a new category of ads within its search lisitngs. A Facebook spokesperson confirmed the test, though declined to state what advertisers are participating. But Adweek encountered several Sponsored results. Gaming companies Disney Interactive Media Group, Zynga, Kixeye and King.com are four of the advertisers who appear to be participating in the test, running ads for their respective Facebook games, Marvel: Avengers Alliance, Zynga Poker, Battle Pirates and Candy Crush Saga; IAC-owned dating site Match.com is also running sponsored listings. The paid listings look like regular search listings, with the exception of an "X" that appears in the upper right corner of each ad, which users can click on to close the ad. In the instances Adweek encountered, the Sponsored category most often showed up atop the organic categories, such as Pages, Apps and People, though in one instance the paid category was below People but above Apps and Pages. Facebook has no plans to roll out the Sponsored category to search results pages, the spokesperson said. While the units are still in testing mode, participating advertisers can buy the Sponsored results ads on a cost-per-click basis and target them according to standard Facebook ad targeting criteria as well as by Page or app names, the Facebook rep said. Although it’s uncertain how often users search on Facebook, advertisers have been craving a better way to crack into the queries than relying on Facebook's questionable search algorithm. Jordan Bitterman, svp and social marketing practice director at Digitas, told Adweek as much in May. “Brands would love to leverage that search space on Facebook,” he said. That appetite could have fed this most recent revenue play, helped by the whomping Facebook’s received by Wall Street since going public in May. The Sponsored search category also continues a trend toward more traditional ads throughout Facebook. Two weeks ago the company announced a beta test for mobile app developers to pay for their apps to be promoted within the Try These Games box within the mobile News Feed. And last week Facebook said it would soon begin testing the ability for brands to pay for their Page posts to appear in non-fans’ News Feeds. 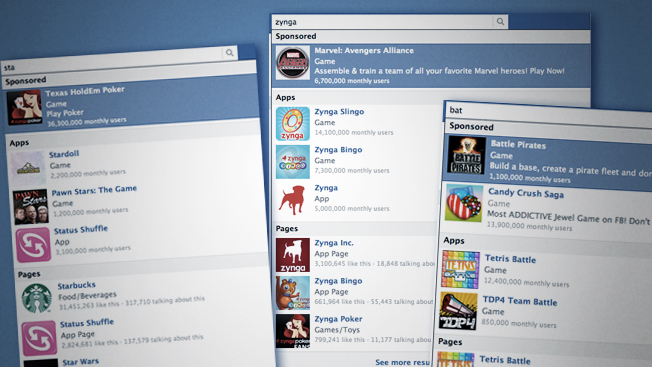 The Sponsored category isn’t the only new category Facebook has recently brought to search. Inside Facebook reported on Monday that the company has added a Top Hit category; it’s also expanded the width of the search typeahead box, which Inside Facebook speculated could lead to more ad copy adjoining the listings.